Update: You can now use the DAC Factory script to automate much of what is described here. The future is decentralized. Lasting value will be created and maintained by communities and their network effect. Centralized hierarchies controlled by the unelected will increasingly be seen as an old, rigid model compared to dyanmic entities where everyone with skin in the game has a voice and those who create value are rewarded according to the consensus of the community expressed through elected custodians. This is what eosDAC is working to build. I'm regularly encouraged by friends in the cryptocurrency space excited about what eosDAC is doing who want to launch their own DACs using our open source technology. 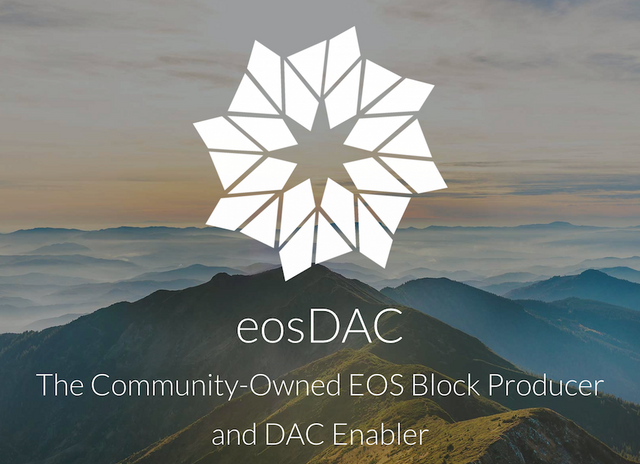 Our two reasons for existing are to be a community-owned EOS block producer and a DAC Enabler. The future vision for DAC Enabling includes a DAC Factory where anyone can launch their own DAC as easily as possible. We're not there yet as it will take plenty of work to streamline the automation of customizations, account creation, set contract actions, and permissions configuration, but we will get there eventually. Our first goal is to finish up the eosDAC Member Client to have all the functionality required to run a DAC with an easy-to-use, decentralized interface. When we turned on Custodian voting a couple months ago, I wrote a post outlining some of the main EOS accounts that make the DAC run along with the Github repos involved: eosDAC Custodian Candidate Voting Is Live!. I was thinking about this again recently with a post describing how Steem could organize itself as a DAC: SteemDAC: A Plan We Can Start Today to Decentralize Steem Governance. Most of the pieces are already in place for anyone to take what we already have today and launch their own DAC. Although this will be much easier in the future with the DAC Factory, I figured it would be useful to outline all the pieces involved for the many who are so excited about this they can't seem to wait before experimenting with their own DAC. This tutorial will walk you through everything, from start to finish, to create your own DAC authority account, along with all the other accounts and contracts which make the DAC function. This tutorial was done on a Mac, but any computer with unix-based emulation will work as well. Get the version of EOS you want to work with, build, and install it (this will take some time). If you don't have the necessary tools or libraries on your computer needed to build these libraries, check the readme file on the EOS Github. $cwd/eos/build/bin/keosd --wallet-dir $cwd --http-server-address localhost:8900 "$@"
Save this wallet password in a password manager or some other secure location. Create and save an EOS keypair which we'll use for creating our accounts on the Jungle test network. 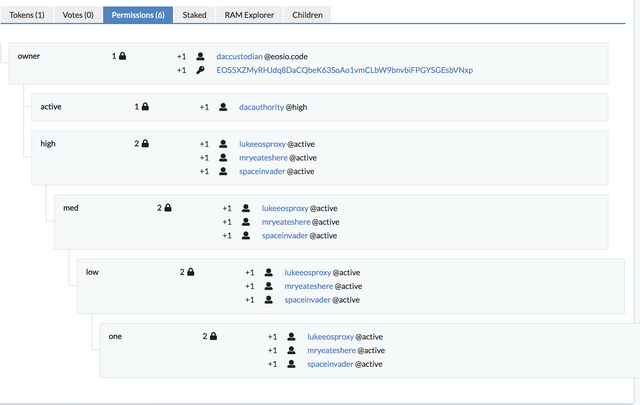 Next head over to the Jungle testnet monitor and create the various accounts we need to run the DAC. We'll start with the authority account: https://monitor.jungletestnet.io/#account I'll show the example names I used, but since those are already taken on Jungle, you'll want to use your own. Throughout this tutorial, just replace the account listed here with the account you've created. You'll want to create your own variations of these account names, just remember they have to be 12 characters long and can't include any symbols, but only letters and numbers 1 though 5. Throughout this tutorial, replace your account names as needed. ./jungle.sh system buyram lukedactoken lukedactoken "30.000 EOS"
./jungle.sh system delegatebw lukedactoken lukedactoken "10.000 EOS" "50.000 EOS"
./jungle.sh system buyram lukedacmulti lukedacmulti "30.000 EOS"
./jungle.sh system delegatebw lukedacmulti lukedacmulti "10.000 EOS" "50.000 EOS"
./jungle.sh system buyram lukedachold1 lukedachold1 "30.000 EOS"
./jungle.sh system delegatebw lukedachold1 lukedachold1 "10.000 EOS" "50.000 EOS"
./jungle.sh system buyram lukedaccusto lukedaccusto "30.000 EOS"
./jungle.sh system delegatebw lukedaccusto lukedaccusto "10.000 EOS" "50.000 EOS"
./jungle.sh system buyram lukedacauth1 lukedacauth1 "30.000 EOS"
./jungle.sh system delegatebw lukedacauth1 lukedacauth1 "10.000 EOS" "50.000 EOS"
If this were on the real mainnet, you'd want to adjust those numbers based on your actual needs. There are currently some tweaks we have to make for the daccustodian account, but in the future this may not be necessary. Now let's start configuring things. The DAC is bound by the Constitution the members agree to. You can host your Constitution anywhere, but the current design hosts it on Github and uses a hash of the document to verify integrity. You should get your own legal advice as to what your Constitution should include, but for demonstration purposes only, I'm going to fork and clone the existing eosDAC Constitution and modify it slightly. 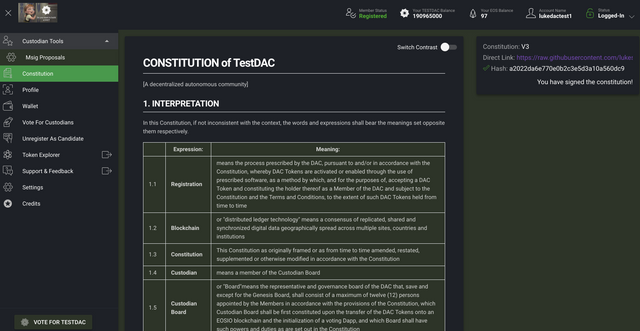 git commit -m "Using TestDAC as an example"
To fully understand how these parameters are used, you may need to read the Constitution and the code. For now, we'll stick with similar values as what eosDAC is using. This can be updated at a later as needed. Note: the permissions on this call are a little unique in that the contract as currently designed requires the lukedacauth1 account which is why we had to make modifications earlier. This will be improved in a future release so the initial set up can be authorized by _self. git commit -a -m "Replacing eosDAC with TestDAC"
git commit -a -m "Updating jungle config for our own needs." 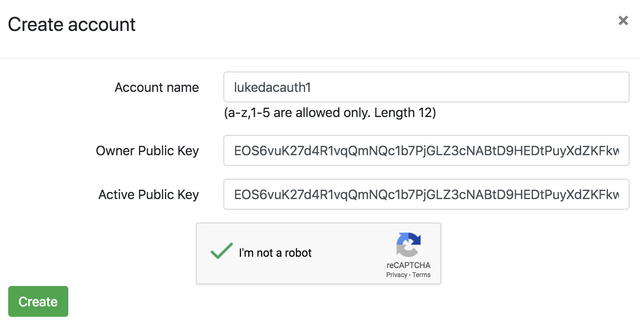 If you have Scatter configured already for the Jungle test net, then you can add the lukedactoken@active account there to transfer tokens around as needed for more testing. Congratulations! You've made great progress so far. Get yourself a beer or your drink of choice! Then move on to the scraper. This tool watches the Jungle chain for member profiles and saves them to mongodb so they can easily be accessed by the member client later. On a production server, you'd want to use the start.sh script and pm2, but just running it via node is fine for our testing. 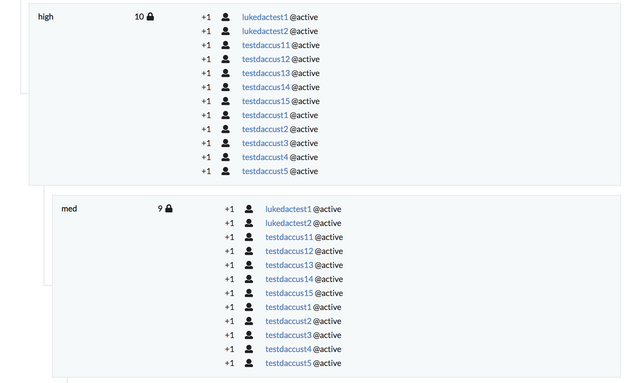 Next up we're going to modify the permissions on all these accounts so that everything will be controlled by lukedacauth1 which will get updated permissions every time a newperiod is called. Using the tesnet permissions script here as a pattern: https://github.com/eosdac/DACtools/blob/master/eosdac-testnet/permissions.sh we can set everything up as we need. In the example above, we keep the key on owner and active in case something breaks in the code and you can't quickly get a multisignature request together to fix it, but in production you'd want to remove the keys from dacauthority_active.json and dacauthority_owner.json and run that last commented out command. To create a key for them to use. You can either use the Scatter interface and your member client or you can do things via cleos. And that's it! You now have your very own DAC to play with! // to match your app's branding. And that's it! Congratulations! You've created your own Decentralized Autonomous Community on the Jungle test net! Customizing the member client involves learning a bit about Material Design, the Quasar framework, and Vue.js. You can also adjust your DAC settings by having more or less than 12 custodians, changing the voting weights, and more. We'd love to get your feedback on this as you start to use it to organize and empower your own communities. To support this ongoing work, please vote for the EOS blockproducer eosdacserver or use a proxy who supports us. 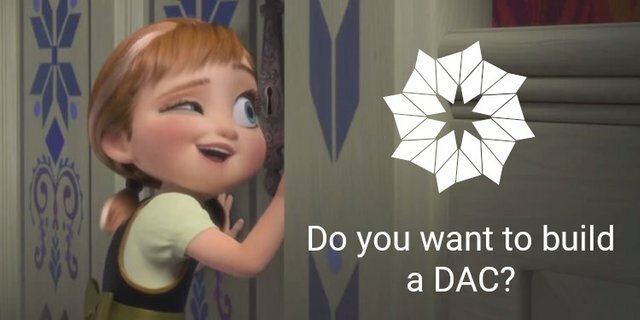 We'd also really like to see more DACs launch and airdrop the tokens they create to our eosDAC members (currently just over 1,900 accounts) who have supoorted us and made this possible. Thank you! Luke with the incredible work and help of Michael, Dallas, Piecesnbits, Nod74, and many more. I'm actually powering down on steem and I'm inactive for months. But this post is VERY helpful. I'm a eosio developer and I learned a lot with this :) thank you guys! One thing I didn't understand is from where the xfer and the dacowner came from... Are they contracts? Accounts? Permissions? Good stuff. Keep up the good work. We need more pioneers like eosDAC who can enable the future. Congratulations @eosdac! You received a personal award!